My kids love camping. I mean, find me a five and seven-year-old who don’t live for playing outside, getting dirty, and staying up late to roast marshmallows over a fire hot enough to melt a soda can. There is possible danger at every turn, and there are no baths. All the things that kids love about camping, are things that non-camping adults hate. Wait, I forgot about bugs. No one likes bugs. Now, we all enjoy going on vacation, and my husband and I love not dropping a ton of cash on those vacations. We like lazy days of swimming and food over a fire, coolers full of beer, and conversation around the campfire. All of these things combined make us great campers. During the summer, we carve out a few weekends, plan our meals carefully, and pack our Rav4 to the brim with gear. We then jam our kids and our black lab in the backseat, and hit the road. 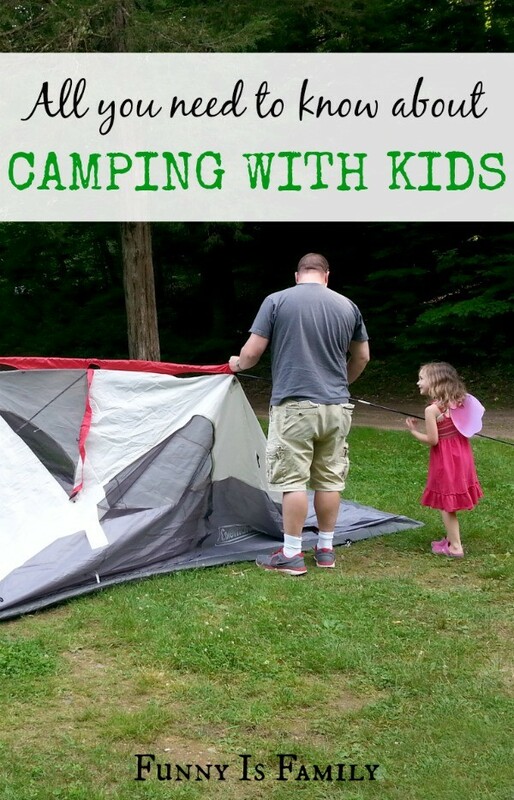 If you are planning on camping with kids, here are a few suggestions from me to you. Family campgrounds aren’t for the hard-core camper, they are better suited for a more fair-weather type. They often have pools and playgrounds, bathrooms with showers, and scheduled activities for those who wish to participate. It is not a secluded environment, but for us, that is just right. Bathrooms with running water and flushing toilets are a must for this mom and her young children. If you’ve ever taken a small child in a porta potty, you know what I mean. Kids like to touch things, especially disgusting things. Also, my kids love to swim. A campground with a pool provides hours of entertainment for adults and kids alike. 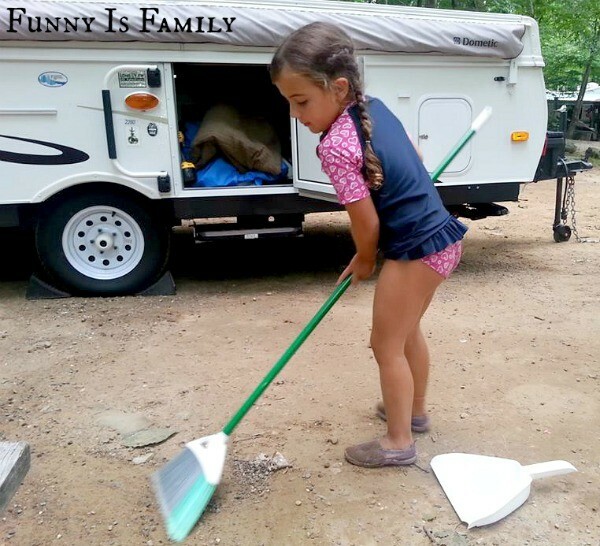 A family campground is going to have other kids running around, and neighbors who are more likely to keep similar schedules, because they have kids, too. I pre-assemble breakfast sandwiches, wrap them in foil, and toss them on the fire in the morning. No dishes are dirtied on site, and we have bacon, egg, and cheese sandwiches to start the day. I pre-make breakfast burritos for the following morning. 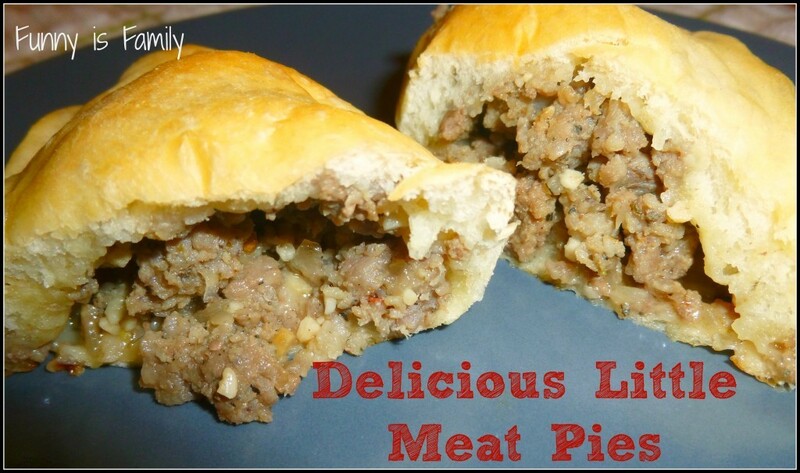 I also like to make these awesome meat pies, or meat pockets, or sausage empanada-type things. Whatever you want to call them, they are delicious, can be warmed over the fire, and are easily eaten without a plate or utensils. Still no dishes, see? We bring yogurt, granola bars, cheese and crackers, and bread and sandwich stuff for lunches. Now we’ve used a spoon for the yogurt and a knife for the sandwiches, but still. Looking good. We open a can of beans and put the can directly over the fire or grill, we bring corn on the cob, and potatoes wrapped in foil, and throw them on the heat source, too. Hot dogs, hamburgers, pre-marinated chicken, and any other food that needs to be cooked can be done this way. Make your list. Check it a billion times. Google the closest Walmart to your campground because you’ll still need it, probably. Lanterns, flashlights, and headlamps (enough for everyone to have one light source) I like these guys that have little removeable lights. They are great for the kids. Most campgrounds have fire pits. 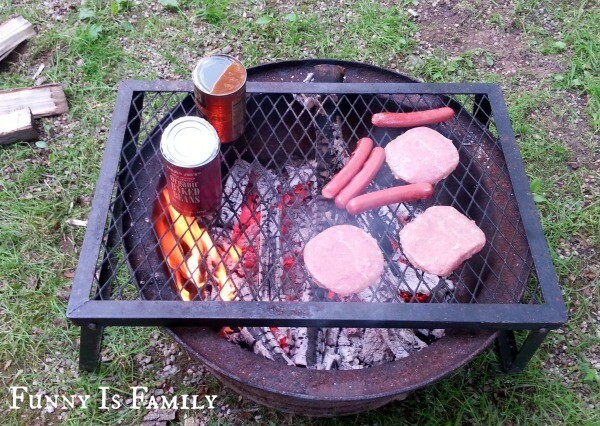 Throw one of these over the fire grill grates over your campfire, and you’re good to go! A broom and dustpan for sweeping out the tent. Or for sweeping the dirt. I would suggest gathering all of these items, and keeping them in one big plastic tote. After the camping trip, I wash what needs to be washed, replace what needs to be replaced, and take out things I don’t want sitting in the garage for a month or ten. Several days before the next trip, I check my list, fill with needed items, and we’re off. My husband says this list should say, “Two coolers. A big one of food, and a bigger one of beer. The end.” But he doesn’t pack the stuff, he just loads it in the car. Camping with kids is wholesome and inexpensive, and creates lasting memories. I love watching my kids dig in the dirt and play with pinecones for three days, and I like smelling like campfire. This list is overwhelming, I know, but for us, it’s totally worth it. Really, the most important thing to bring when camping with kids is other fun people who also have kids. What did I forget? Tell me now, because we’re camping soon! Follow my Camping board on Pinterest for more camping lists, recipes, and tips! 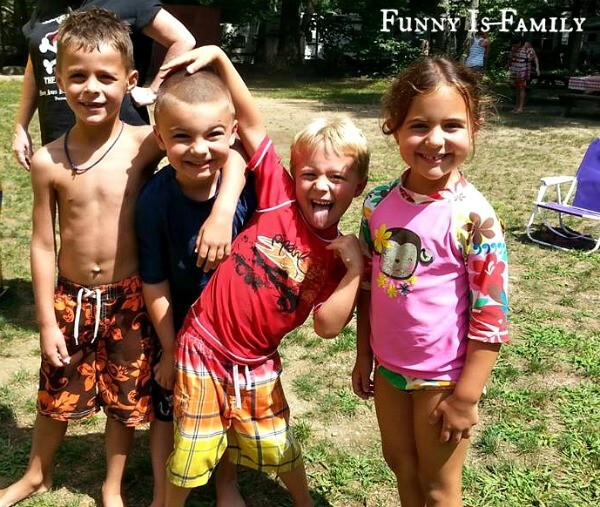 Follow FunnyIsFamily’s board Camping on Pinterest. I love that lantern! Adding it to my wishlist now! Thanks for sharing such a great list! You’re welcome! That lantern really is the bomb. Your kids will agree. What a helpful guide! And those meat pies look DELICIOUS. They totally are, Shay. Fo reals. Whenever our family goes camping, the first thing that get’s set-up is the hammock. Followed immediately by negotiations between the kids over the schedule of said hammock.